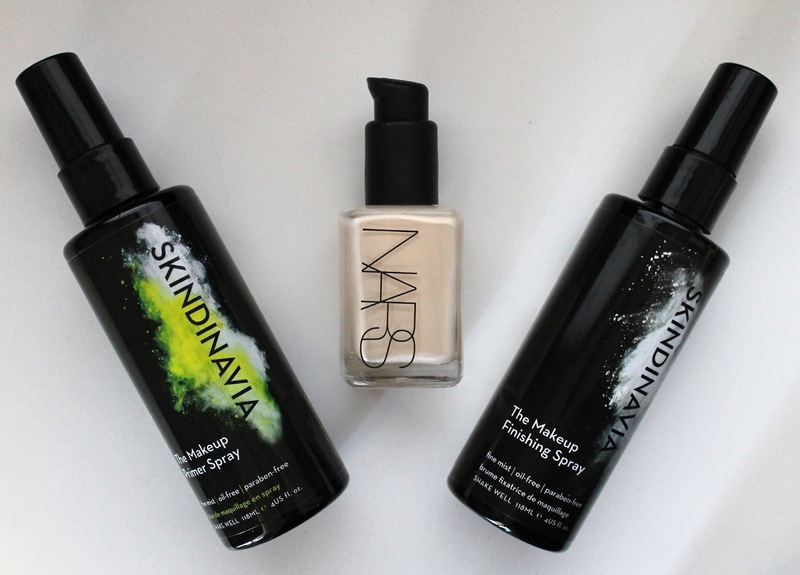 I have wanted to try these Skindinävia The Makeup Primer Spray and Finishing Spray for the longest time because I hear nothing but good things, especially from makeup artists. I am very glad to say that they certainly do not disappoint! I hadn't heard as much about the Primer spray compared to the Finishing Spray but it most certainly impressed me from the very first use. I love my Nars Sheer Glow foundation but I find that it is a lot harder and more time consuming to apply and I always had to use my fingers to blend it in even though I prefer to use a brush. Even when using the Nars Pro Prime Pore Refining Primer, I didn't feel like it helped at all to blend in my foundation. I would always get spots on more forehead and nose where it would cling to the pores in little dots of foundation that had to be buffed in. The Skindinävia Primer Spray completely changed the way that Sheer Glow went on my face! Suddenly it buffed in easily with my Sigma F80 Flat Top Kabuki Brush without settling into pores or requiring me to go back in and blend spots with my fingers. It made my morning foundation application way simpler and quicker! Because I don't have oily skin my foundation does a pretty good job of lasting all by itself so I use primers more to create a flawless base for my foundation to easily buff onto. That being said though, I did use this primer spray with my Lancôme Teint Miracle foundation which is a lot dewier and tends not to last as long as the Sheer Glow and it certainly extended the wear time. - Note: Skindinävia is currently having a 20% off sale for this Primer Spray. Just use the code "20SKPRIMER" when ordering from their official site. I was especially excited to try this one after being constantly disappointing and turned off by drugstore finishing sprays that don't seem to do anything. This one is definitely not like the others! As I said, my skin is fairly normal so my foundation lasts well by itself but the biggest difference I saw with this setting spray was how well my powder blush, foundation and highlighters lasted on my face. A couple of days ago, because I was doing my makeup in poor lighting I overdid my blush a little bit (we've all been there) and when I noticed driving to work I just thought to myself "Oh it's okay, it will settle. Blush always does." Yeah, it didn't! The only thing I did differently was use this Finishing Spray and my blush stayed super vibrant all day long which never happens even though I usually use very good high end blushes like Nars and Hourglass! This Finishing Spray does a particularly amazing job of setting powders because I think by the time you get to spraying it, liquid foundations have already set nicely by themselves (depending on the formula of course). I also even sprayed this on a fluffy eye shadow brush patted it over my eyeshadow to set which kept things much more vibrant throughout the day as well as patting it on the bridge of my nose where my glasses sit to prevent transfer which really seemed to work! When you try it you can actually feel it setting and making a difference while still being comfortable and imperceptible after it has set unlike all the drugstore ones that just feel like a refreshing rosewater spritz. As you can probably tell, I loved both of these sprays. After hearing wonderful things about Skindinävia for so long, I was very happy that the products lived up to the hype. Both of these sprays also come in an oil control formulas for the oilier skin types, so I am sure you can find Skindinävia products to suit you and to keep your makeup from doing a runner on you. Also, in addition to offering amazing products, Skindinávia also offer a 30 day money back guarantee so you really have nothing to loose by trying these out. Have you ever tried any Skindinävia products or will you be checking them out after reading this? Let me know below in the comments. Disclaimer: These products were sent to me as a PR sample but I received them with absolutely no obligations to write positive reviews and as you can tell from their 30 day guarantee, Skindinävia stands by their products and let them speak for themselves. Also, after I run out of these you can bet that I will be purchasing them with my own money because they are completely worth it!